2018 repress; LP version. Odion Livingstone present another reissue from the Nigerian archives, the first ever international release of The Apples’ essential Afro-funk rarity Mind Twister, originally released in 1978. As part of the St Gregory’s student band scene in Lagos during the late ’70s alongside Ofege, Grotto, and more, Apples were picked up and produced by legendary EMI Nigeria producer Odion Iruoje who added overdubs to the album at Abbey Road in London with Curved Air keyboardist Francis Monkman. The band met and formed in Lagos. Bandleader Frank Ikpefuran teamed up with Georges Vieira from the American School and brothers Clifford and Gerard Nagi who were studying at St Greg’s in Lagos, and remembers, “I must have been 19 years old when I met Clifford. We used to hangout on Victoria Island, watching bands play and jamming with them. That’s how we met Georges. We all listened to Jimi Hendrix, Santana, Idris Muhammad and the Beatles.” “We started jamming with Clifford on the guitar, his brother Gerard on the bass and Georges on the guitar. We chipped in with song ideas, with the group contributing arrangements and refining things until we were satisfied. The band had a natural sound, which stemmed from the chemistry we had. It was a strange chemistry, we were an odd combination from different backgrounds but when we played, something happened…” After landing a residency at Tee Mac’s club in Surulere, Apples auditioned for Odion Iruoje who arranged recording dates and cut the record. For a young band, Iruoje was surprised by the quality of the band, adding in extra keyboard parts from Lemmy Udofia and Francis Monkman, founder of Curved Air and session man for Kate Bush, Sky, and music libraries like BBC Music, Bruton, and KPM. 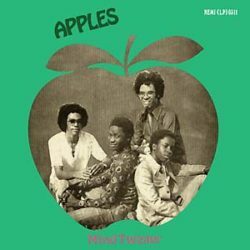 Iruoje remembers, “their playing added a layer of sophistication and sheen without encumbering proceedings.” This definitive edition of Apples’ Mind Twister features new interviews with bandleader Frank Ikpefuran and producer Odion Iruoje. Fully remastered by The Carvery.